Written by Eden H Roquelaire for Twin Peaks Freaks. DISCLAIMER: Spoilers for Twin Peaks within the article. 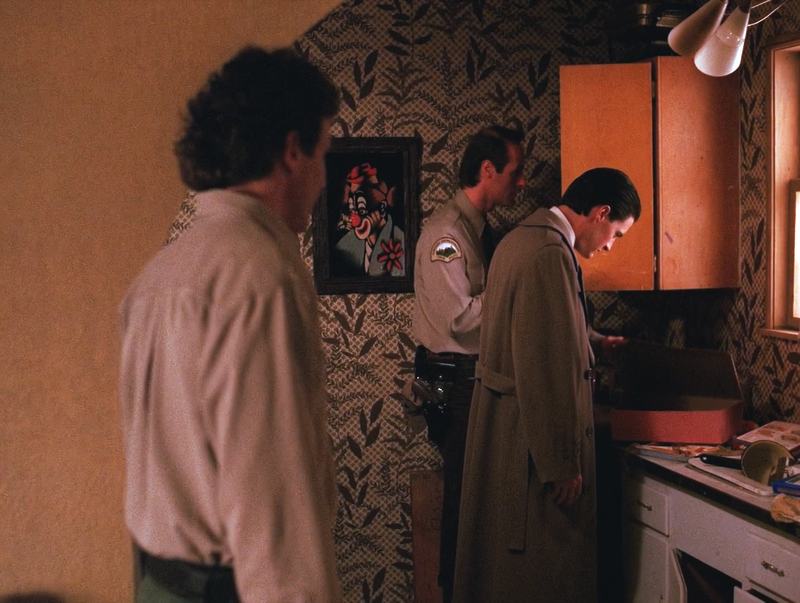 Every Twin Peaks fan is familiar with the Native American imagery that appears throughout the series, but it turns out that the tribal influence may go deeper than just inspiring the look of the show: In fact, it may be the source for the central story-line. The Black Lodge and the Dugpas. Sacred Clowns are often depicted as painted in black and white, like the carpet on the floor of the Black Lodge. Heyókȟa are thought of as being backwards-forwards, upside-down, or contrary in nature. It was manifest by doing things backwards or unconventionally — riding a horse backwards, wearing clothes inside-out, or speaking in a backwards language. For example, if food were scarce, a heyókȟa would sit around and complain about how full he was; during a baking hot heat wave a heyókȟa would shiver with cold and put on gloves and cover himself with a thick blanket. 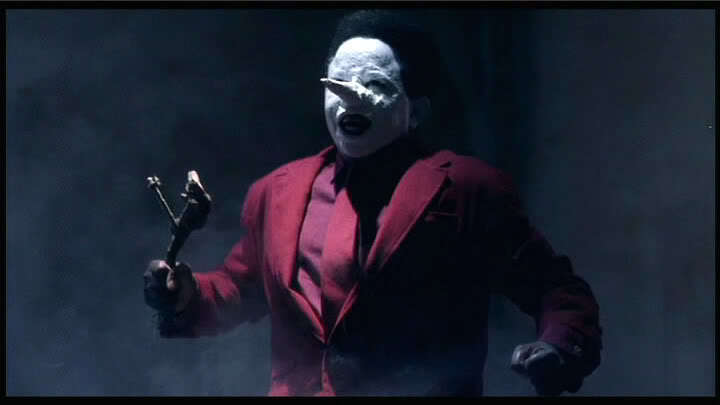 The Jumping Man, seen in Fire Walk With Me. That is the so-called “Jumping Man,” who appears in Fire Walk With Me, most notably dancing at the meeting above the convenience store. He carries a stick, perhaps a dowsing rod, and hops around. He is speculated to be a magician or priest. Perhaps he is a Heyoka? Various Native American tribes have versions of these beings: the Cherokee have the Boogers, the Zuni have the Ne’wekwe, and the Lakota call them the Heyoka. 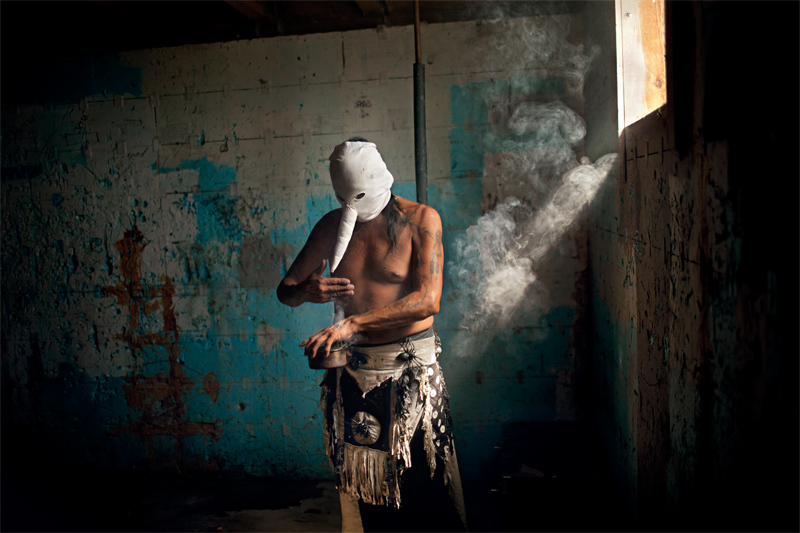 A person who becomes a Heyoka is one who is inspired by a visit from a Wakinyan or Thunderbird, a powerful spiritual being who is always cloaked in storm clouds. The Thunderbird usually appears to them in a dream, which is considered to be a communication from the Wakan Tanka, the Great Spirit (or Great Mystery) of the Lakota. 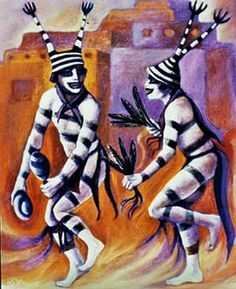 The Sacred Clowns are known to do bizarre things that are contrary to our logic, including speak and walking backwards, saying the opposite of what they mean, wearing cold weather clothes in hot climates, laughing when sad, and crying when happy. They are said to be able to interpret dreams. They also have a connection to celestial bodies and electricity, as they are associated with lightning, and the legendary Thunderbird. The rites of sacred clowning are also practiced in Tibetan Buddhism, which, as we know, has a powerful influence on Coop. 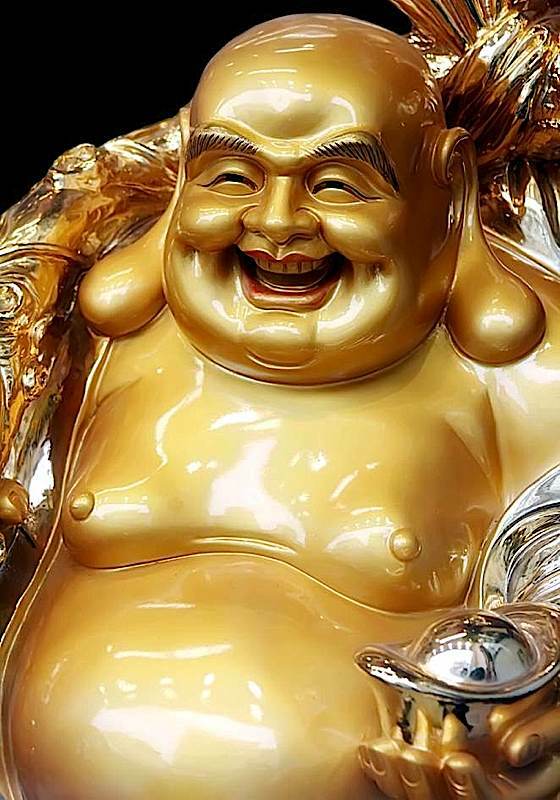 A clown in Tibetan Buddhism would be to do absurd things – wear shoes on one’s head, call a stone soft, wear rags to meet a prince and expensive clothes to meet a pauper. The method behind this is to teach disciples of Buddhism to think outside the bonds of the reality we are familiar with, to consider less orthodox explanations, and encourage a sense of wonder and curiosity. When one assumes they know everything there is to know, then the mind is not open to learn. 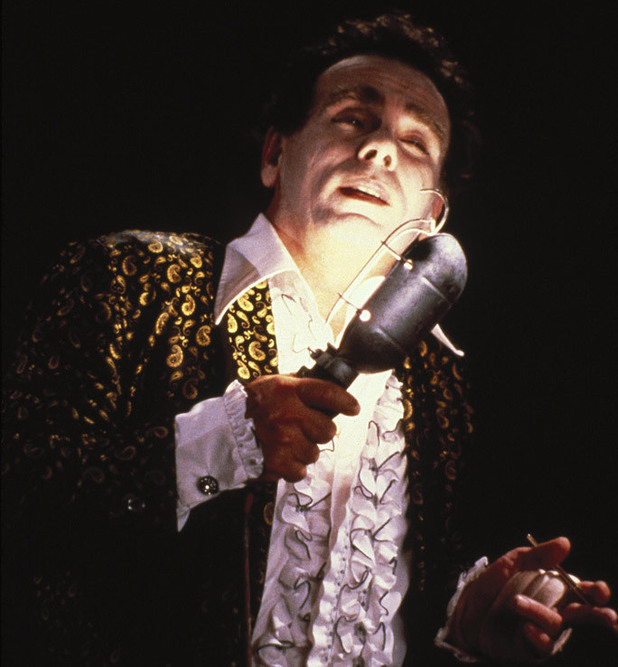 In its own way, David Lynch’s work itself does this, by way of his absurdist humor, which sometimes occurs at the most inappropriate of times. It makes us laugh amidst the horror and tragedy going on around us. This act of unsettling our minds and giving rise to doubt causes us to reconsider what we believe is happening, and what it means. In a sense, it forces us to search for new meaning in the familiar. 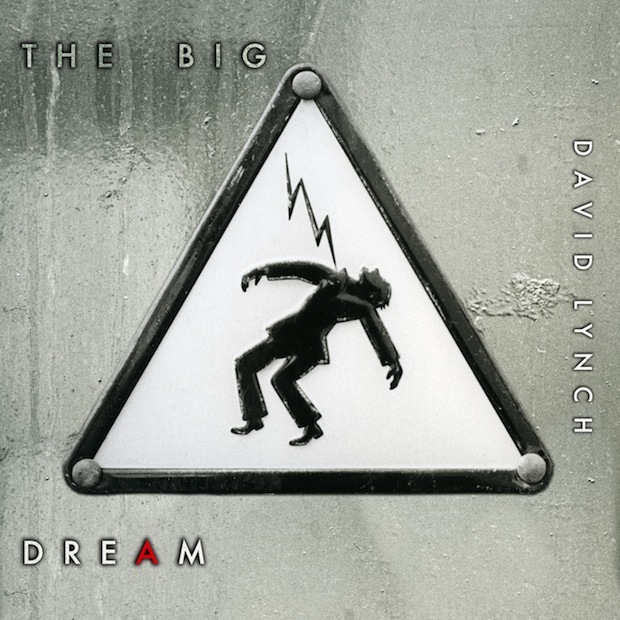 It’s a man being struck by a lightning bolt, and of course, the title of the album is “The Big Dream.” This implies it is a dream of some importance, perhaps a “divine revelation” of sorts. Could this cover be a representation of a revelation from the Thunderbird, in the form of a dream? Now you might be saying, “But the Dugpas aren’t good beings; they aren’t teachers or benefactors to humanity.” I would argue that the Dugpas are neither good nor bad; some go rogue, as BOB did, but the Man From Another Place has been shown helping Cooper, as has the Giant. I would say that this is because they had a common interest, and therefore could be compelled to help Cooper. BOB is the only one, I would venture to say, who evokes evil. The others who dwell in the Lodge are amoral, and only act in their own self-interest. This in and of itself ties in with the sporadic nature of the Sacred Clown teachers, who work with opposites and contrast. 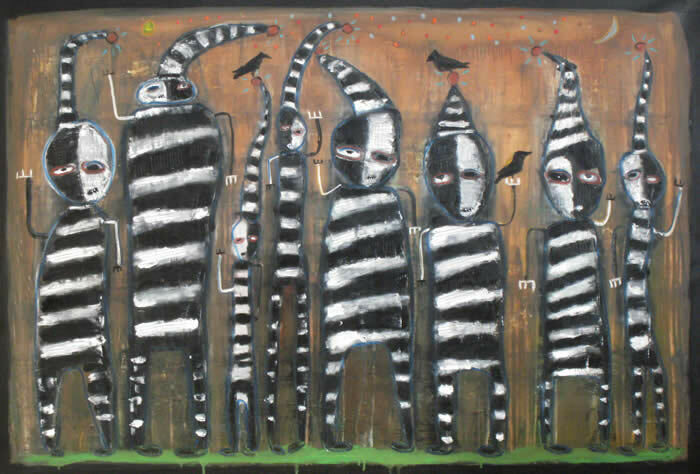 Both the Dugpas and Sacred Clowns fit into the Trickster category of deities and spirits, along with characters such as Loki, Anansi, Crow, and Prometheus. Often these beings are shown as acting dangerously and amorally, but sometimes these actions also benefit humans, as shown in the tale of Prometheus stealing fire. Other times, the character may start out doing more harmless fun, but eventually graduate to all-out chaos and evil, such as Loki and his plot to murder the light god Balder. Trickster spirits are never easy to pin down; as soon as you think you have them figured out, they change their nature. Leo isn’t clowning around… well, maybe a little, actually. The clown painting found in Jacques Renault’s apartment. And this symbolism isn’t limited to Twin Peaks. Remember Ben singing about the Candy Colored Clown in Frank Booth’s favorite song? And the way Frank paints his lips when he listens to the same song later? These characters are both associated with drugs, violence, and all-around debased behavior, just as Jacques and Leo are. This is their “Suffocating Rubber Clown Suit of Negativity” that they bury themselves in rather than facing their demons and evolving as people. 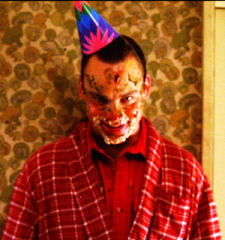 Of course, BOB’s idea of fun is one of evil and debauchery, spreading the suffocating negativity everywhere he goes. Definitely looks like it could be the Black Lodge’s idea of a party, where they gather to feed on the Garmonbozia that BOB has collected. There is the Jumping Man in the corner, who, as we discussed, may be a Heyoka. Perhaps he is leading the feeding ceremony. 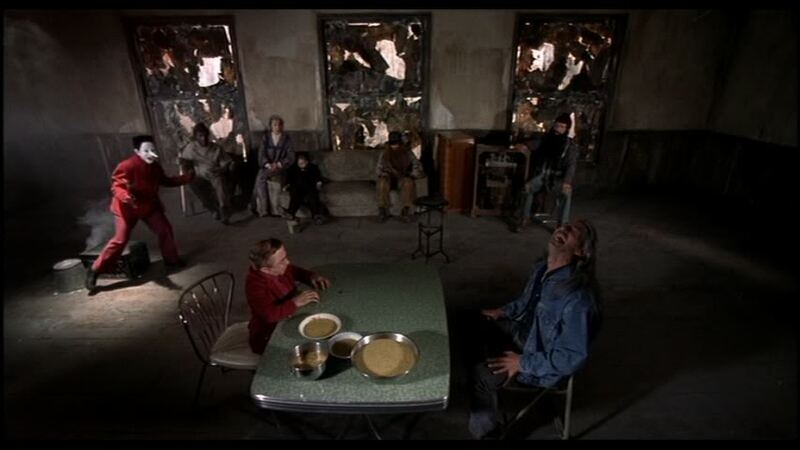 BOB is sitting at the table, throwing his head back in uproarious laughter. As a final point, let us discuss the Greek God Dionysus. He is the God of wine, revelry, feasting, ecstasy, and is the all-around life of the party. He and his parties are dual-natured: They can bring about both horrible violence and beautiful knowledge. Many of the parties end with his followers, the Bacchantes, ripping apart uninitiated passersby, as was the case with Orpheus. However, this was also a cult of the secrets of the Earth, where one could learn Nature Magick and arcane wisdom. There was obvious risk in being involved in this cult, but there were benefits that could make those risks justifiable. Similarly, Cooper is taking a sizable risk in entering the Black Lodge; however, if he succeeds, the benefits could be worth it. If he loses, he will be ripped apart, spiritually. Trickster Spirits are beings of both chaos and wisdom: There are some things that you can only learn from these beings, and yet to learn from them takes tremendous risk. However, it is often in our times of darkness, strife, and chaos that we have our revelations, and realize important things about ourselves. It is through trial that we evolve, and through constant questioning that we learn. The Sacred Clowns and Tricksters of various cultures embody that chaotic path to wisdom. 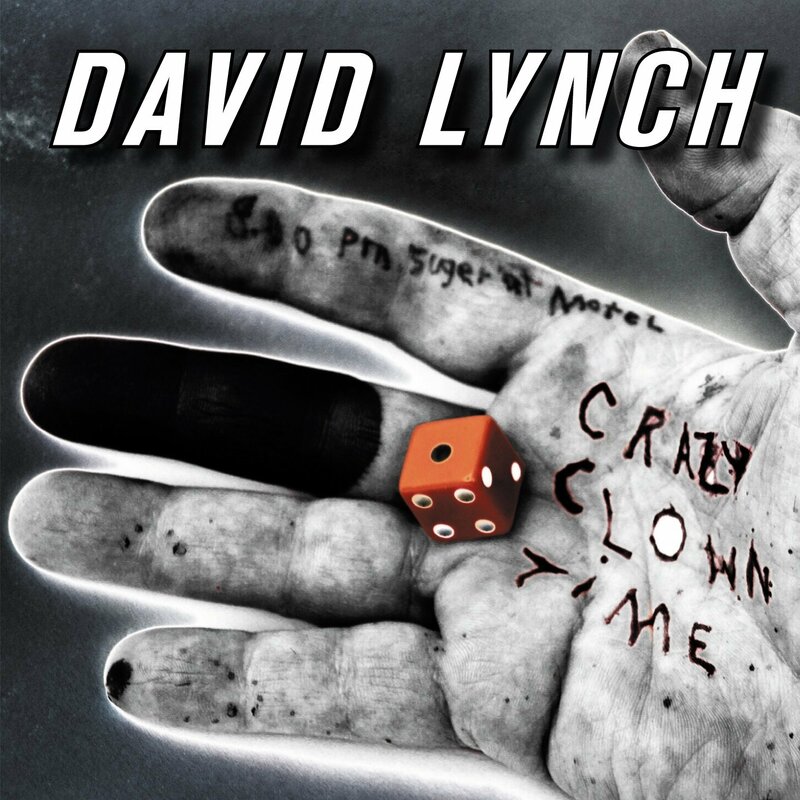 This entry was posted in David Lynch, Mark Frost, Television, Twin Peaks and tagged #PeaksFreaks, #TwinPeaksFreaks, Above the Convenience Store, Agent Cooper, Analysis, Archetypes, Bacchanal, Bacchante, Black Lodge, Blackfoot, Blue Velvet, Clowns, Crazy Clown Time, David Lynch, Dionysus, Electricity, Fire Walk With Me, Frank Booth, Garmonbozia, Great Mystery, Great Spirit, Heyoka, Jacques Renault, Killer BOB, Lakota, Laughing Buddha, Leo Johnson, Little Man From Another Place, Man From Another Place, Mark Frost, Native American, Orpheus, Party, Sacred Clown, Suffocating Rubber Clown Suit, The Big Dream, The Giant, The Jumping Man, The One Armed Man, Thunderbird, Tibetan Buddhism, Trickster, Wakan Tanka, Zuni. Non sono uso rebloggare articoli, ma questo credo meriti molto. È in inglese ma sono sicuro che chi è interessato non avrà problemi.